Founded in 1904, Wilmington Fibre holds an outstanding reputation in non-metallic fabrication services from our facility in New Castle, Delaware. A perfect example of this is our non-metal screw machining services. We operate advanced 4-axis machinery, providing taping, knurling, threads, forms, bores, and reams on non-metallic parts up to 2" in diameter and to tolerances of Â±0.001". These machining systems utilize automation features that allow for high speed precision machining with short cycle time. Some of the applications of our non-metal screw machining include bushings for conveyor belts, pulleys for exercise equipment, and hanger bearings for conveyor belts. We work with a diverse array of non-metallic materials, including PEEK, PTFE, Vulcanized Fibre, phenolics, PVC, glass filled nylon, and DelrinÂ®, just to name a few. We embrace a tradition of quality at Wilmington Fibre; we employ in-house quality programs, and are compliant to MIL-I-208A, and we also meet a variety of high industry standards such as the ASTM-D-710, MIL-I-45208A, FDA, and AMS. 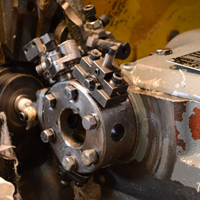 Screw Machining is a cost-effective alternative to injection molding. We produce these parts in volumes ranging from 1 to 500,000, with lead times ranging from 2 to 4 weeks depending on quantity. To learn more about the quality non-metal screw machining we provide, please see the table below or contact us directly.